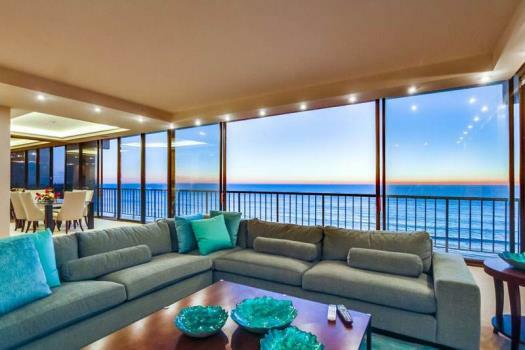 This gorgeous three story stand-alone home with a private patio is only steps away from the ocean. This unit has beautiful wood beams, high ceilings, and updated flooring. On the ground level there is a bedroom with a queen bed and en-suite shower/tub bathroom. From this room, there is a sliding door to the private patio which allows the gorgeous ocean breeze to keep you cool. The private patio is surrounded by a beautiful garden that is sure to make you smile every morning. There is also a BBQ on the patio and lots of outside seating and tables. On the second level, the kitchen awaits. This galley style kitchen is fully equipped with all standard kitchen appliances along with microwave and dishwasher. There is a small dining table and lounge area in the living room with a full size futon for sitting during the day or to use as an additional bed at night. 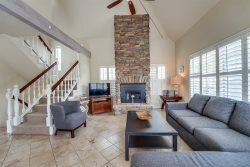 You'll also find a sitting chair, fireplace, one wall mounted flat screen TV with cable and large picture window overlooking the beautiful garden patio. Also on the second level is the 2nd bedroom with a full size bed. The third level is where you will find the master bedroom with a queen size bed, beautiful courtyard views, large windows providing tons of natural light. You'll also find the 2nd full size bathroom with a stand up shower. The real bonus of this unit are the 2 separate large vehicle carport parking spaces (can fit suburban)! WiFi & cable. Laundry room is located outside on the ground level. This unit can accommodate a maximum of 8 guests. No Pets or smoking allowed anywhere on the premises.